When Lindsey Wargo brought her class from the Cleveland Clinic Center for Autism to Fieldstone Farm she wasn’t sure what to expect. After a six-week session, she could not believe how well her students responded to the program. “It was amazing!” she said. The students gained independence, built self-esteem and were able to listen to directions, sequence, and work directly with the Fieldstone Farm instructors. It was particularly significant that Lindsey and her teaching team could step into the background while her students worked directly with the Fieldstone Farm instructors. Her students usually have difficulty socializing with new people but were readily able to connect with the Fieldstone Farm staff. 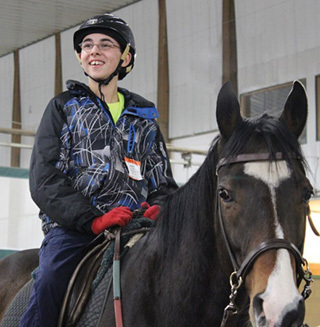 The Cleveland Clinic Center for Autism continues to bring classes to Fieldstone Farm every year.